The dog days of summer are upon us, the final month of a particularly unusual movie season. The summer of 2013 has brought us a few easily predicted smashes (Iron Man 3 chief among them), but the embarrassing bombs have been occasionally surprising (The Lone Ranger, Pacific Rim, and White House Down all have more entertainment value than their receptions suggest). A few smaller movies, the kind not typically associated with summer, have crept in as sleeper hits (notably the modestly budgeted fright flicks The Conjuring and The Purge). So here we are, first weekend of August, with a buddy action flick that could’ve been released at any time of the year: 2 Guns. If you’ve seen the trailer, you already know this movie’s primary selling point. 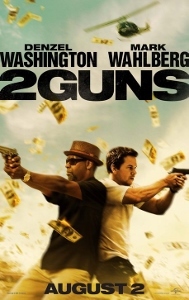 It’s the two above-the-title names: Denzel Washington and Mark Wahlberg. That’s the draw. If you like either or preferably both of these guys, then 2 Guns is for you. The trailer also reveals that they’re both playing undercover law enforcement agents who don’t know they’re both good guys. Bobby Trench (Washington) is a DEA agent attempting to bring down a Mexican drug cartel run by Papi Greco (Edward James Olmos). Marcus Stigman (Wahlberg) is NCIS agent who is essentially a patsy for a group of corrupt Naval officers whose objective is to drain a CIA slush fund. The wise-cracking camaraderie between Washington and Wahlberg is relaxed and funny. Normally a stoic bore in action-oriented roles, Wahlberg seems energized playing opposite Washington. As Trench and Stigman slowly realize they’re supposed to be playing for the same team, their hard-earned friendship carries the film through some dull stretches. Unfortunately, their commendable efforts are wasted in a confusing plot that relies heavily on unlikely coincidences. I thought another of this summer’s surprisingly successful smaller films Now You See Me was too reliant on such implausible twists, but at least that film seems to have a winking acknowledgement of how ridiculous it actually is. 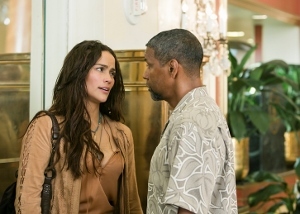 2 Guns, though laced with humor, puts its twists and turns across with all the subtlety of a sledgehammer. And when the filmmakers are uncertain of how to get their heroes out of a tight spot, the answer is always to start shooting. Part of the reason 2 Guns never quite comes together is its lack of a clear-cut villain. Between Olmos’ drug lord, James Marsden’s Quince (one of the corrupt Navy guys), and Bill Paxton as an ill-defined CIA agent, it’s as if they couldn’t decide who was really behind everything. The movie is based on a comic book series of the same name and perhaps the storytelling is surer-handed on the page. Here it becomes a jumbled, everything-but-the-kitchen-sink mess. On top of all the villains, there’s also a femme fatale (Paula Patton) of uncertain motives thrown in for good measure. Director Baltasar Kormákur (with whom Wahlberg previously worked on the far less watchable Contraband) can’t keep it all straight. There are better movies out there. Wait for home video on this one.